Today I was presenting at a school and was thrilled to see some of the artwork the kids produced during my session of “Goblin Designing 101.” There were some incredibly talented illustrators! But that was during my visit. An activity that the kids completed before my arrival was to take one of my colouring pages (from kendrakandlestar.com) and make up a little story to go with the picture. They were all wonderful, but one in particular made me laugh out loud. Check it out! Who wouldn’t want a magical refrigerator that has a never-ending supply of chocolate cake? Maybe we can get Ratchet Ringtail to get working on such an invention. I just might be the first in line to buy one! Dastardly times . . . I was at a school yesterday, teaching a workshop on how to create great fantasy/adventure villains. Of course, I not only refer to some of the all time greats, but to some of those scoundrels that like to menace poor Kendra Kandlestar. It’s such a delight meeting and working with the kids. My favourite creation of hte day? “Cheesehead,” who came complete with cracker-shaped henchmen. What a riot! I don’t ever sit down to write with a bunch of themes in my head. In truth, I think this is the wrong way to approach storytelling.Rather, I like to let certain patterns evolve. It happens naturally, I find. Well, as I work on Kendra IV, I’m finding that this story is a series of falls. And I don’t mean figurative, metaphorical falls, like a proud character getting knocked down a peg—I mean literal falls! In the first five chapters alone, I think Kendra has fallen five or six times, and some of those falls have been looooooooooong drops! We’ll I’ve never plummeted far as Kendra, mind you, but I once did stumble into a gaping pit at Kom Ombo temple in Egypt. But that’s a story for another time . . .
As much as I love my existing characters, it’s always fun when I get to introduce some new ones. Trust, readers, trust. All will be revealed! And why does he look so nervous? Well, his apprentice has been causing some trouble, so he’s being called before the Council of Elders to answer for his pupil. And just who is his apprentice? Well, I’m not going to tell you everything. Oh, and the bug? Well, let’s just call him Ibb for now. EEK! I’m afraid I didn’t get any work done today on my book, mostly because I spent the day at Bonaccord Elementary, helping the students there create their own stories by helping them design monstrous characters. Surprisingly, it’s NOT Kendra. Don’t get me wrong, I love “Braids,” but I always seem to like the other, slightly more obscure characters. PLUS, it seems like I always attach myself to a different character with each book. In The Box of Whispers it was grumpy old Griffinskitch. Can you guess who it was for The Door to Unger? We all created Jedi names (I’m Master Fodiwan, of course) and donned robes and lightsabers—and voila! We had our very own jedi council for the game. 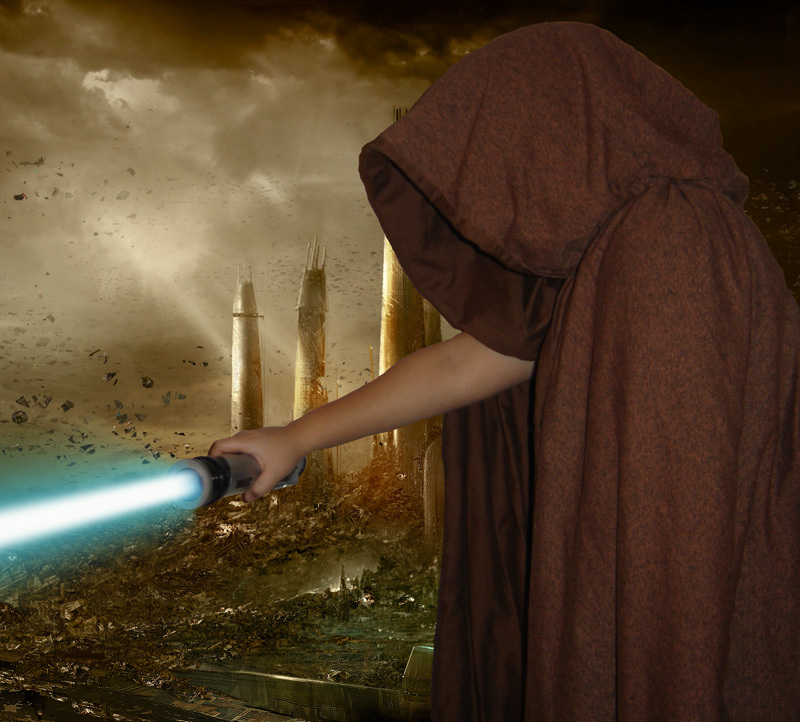 Afterwards, I photographed everyone and added lightsaber blades in Photoshop. I can’t wait to read the stories they are all writing, as inspired by our game and costumes! Ratchet Ringtail's workshop? No, just another one of "Mr. Wiz's" writing classes. I just finished up my most recent term of Dream Workshop yesterday, and as part of it I produced a little iMovie slideshow to celebrate our fifteen weeks of chaotic creativity. This was one of my most favourite photos from the slideshow—just one of the many spills during my magic potions class. Hey, if you’re going to make kids write magic spells, they should at least actually concoct the potion first! One of my students from a different class also gave me a cute little picture that she drew. She didn’t tell me why she drew them, or if where they came from (I’m assuming from her own unique coconut). Maybe these could be new inhabitants in the land of Een? Ratchet Ringtail wouldn’t have created them—they look far too happy.